Why do you need a genius nutrition plan ? When you plan on losing weight, working out is important but 72% of your results will come from your diet. By diet I don’t just mean eating nothing but vegetables or some other crazy fad diet but having a healthy mix of foods and, most important of all, eating meals that you enjoy so you have the motivation to continue. I’m pretty sure that in my everyday diet, I could replace some of my meals with healthier options or stop eating some treats like ice cream or restrain myself from eating French fries. But, let’s be honest, the most important factor to reach your goals is motivation. When you feel motivated you can be disciplined and put in a lot of effort, but you also need some pleasures like snacks or treats, say ice cream or French fries, once in a while so you can take a small break from your journey to success. Very strict diets are no fun and hard to stick to so while some sacrifices are necessary, it’s a good idea to indulge yourself with some small pleasures once in a while to keep your motivation levels high. A diet plan is a very important part of your losing weight goal so let’s see how 21 day fix, available at amazon.com, addresses it and how it can help you to organize your meals, while keeping you motivated. As you may know, Beach Body – one of the most popular home workout programs – has created a color coded container system for making organizing your diet easier. In other words, you have a set of containers with different sizes and colors. What does that mean? The sizes tell you how much you can eat, and the colors tell you the type of food. That way you don’t have to weigh or measure everything in order to prepare your meals but just need to pick the type of food and fill each container to know the exact recommended amount for your target calories. Your target calories, and I’ll explain next, will define the number of containers that you can have per day. While this may sound confusing, it is in fact very easy and straightforward once you understand this genius concept. In total you have 7 containers in 6 different colors and sizes .Each container must be filled with the respective type of food. The 21 Day Fix program uses seven containers in six different sizes and colors to make eating healthily and losing weight simple and easy. Each container must be filled with the respective type of food; the number of containers you use depending on your daily calorie needs. Where I can get the 21 Day Fix Containers ? There are several different container options available but I recommend you to get the official Beachbody containers, because they are the only ones that have the exact measurements as defined by the eating plan. I, personally, recommend the Beachbody’s Portion Fix (my review here), which includes all the color coded containers, plus the Shaker Cup and The Portion Fix Eating Guide, also available on amazon.com. Why ? These containers have the official size and measures as defined on the 21 Day Fix eating plan. This set does not include the eating plan or any sort of instructions. The containers are BPA-free and DEHP-free and you can use them in your microwave and they are dishwasher safe too. 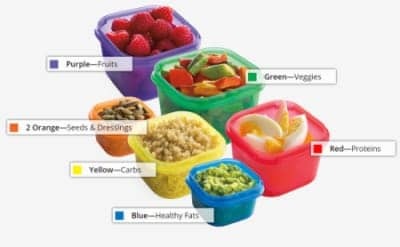 If you are only looking for the containers I recommend you to get the official Beachbody Portion Control Seven Piece Container Kit at amazon.com . Would you like to know more about this kit ? read my 21 day Fix 7 Piece Containers Kit review. Once you have your containers, the next step is to calculate your daily caloric intake, which is the target calories mentioned before, so you know how many containers you should use per day. Your caloric need – 750 (calorie deficit) = Your target calories. Using the 21 Day Fix nutritional system, I know the number of each colored container that I can use for each day. Ok, now that we know our target let’s continue ! The 21 Day Fix defines 4 different target calories ranges that will determine your daily diet. Note: If you target calories is under 1200 then stick to the 1200 target, and if it’s more than 2300 go with the 2300 calories target. This is the genius part of this nutritional plan – you don’t have to weigh what you are eating or write it down. You know how many containers of each type of food you can eat per day and you just need to fill them and eat. It’s up to you to organize the order of which containers you eat first. Think about what you like most to eat when you wake up, for a morning snack, at lunch time, for an afternoon snack and for dinner. However, it’s always recommended that you plan 3 main meals: breakfast, lunch and dinner. In between meals is good to have snacks so you don’t get too hungry waiting for the next meal. Prepare 2 or 3 snacks a day between the main meals. Drinking water is always good; it helps to keep you hydrated and is a good way to reduce your appetite between meals or snacks. You can also drink coffee and tea but in my personal experience, I found tea works best. Try both to see which one works better for you or which one you like most. Tip: If you feel hungry between meals, Autumn Calabrese, recommends you to consume an extra green container (vegetables). You already know how many containers of each color you can use in your daily meals so it’s time to find what products you can use for each container. There are a lot of options, and from my experience, I recommend you to pick the ones you like best so you can prepare tasty meals. Tasty meals play an important role in keeping you motivated and giving you the energy to start each new day with a positive attitude. Note: It’s always recommended to choose seasonal vegetables and fruits and, if you have the chance, pick locally-produced veggies/fruits. Seasonal veggies and fruits are cheaper and local products are usually healthier. We’ve all had the experience of going grocery shopping without a list and ending up buying a ton of things we didn’t need while forgetting the things we actually went shopping for. Plus, if you are feeling hungry, eat something before going shopping. Feeling hungry and not having a shopping list are 2 important things to avoid before grocery shopping. Check some of above ideas for each container, pick your favorites and MAKE a list of all the products you need for the day. Do this a couple of days per week or weekly as your schedule allows. Personally I prefer to go grocery shopping weekly rather than every couple of days but do whatever works best for you. I find useful to have my own weekly calendar with all the daily 5 meals (3 main meals and 2 snacks) planned in advance. After I print the calendar I then stick it on my fridge so I can check it in the morning. It also makes it easier to organize my grocery list. Since my calorie target is 1200, I’ve created my own weekly calendar meal planner using the recipes I like most so I can keep motivated and enjoy each meal or snack. I’ll share it with you so you can use the same plan or get ideas to build your own. Use this link if you would like to download the PDF version. I have also made my meal planner template available so you can edit, change and fill with your own meals for your week. 1 more Yellow Container – Add more carbs by including a bagel for your morning snack or cereals before you go to bed. Depending on your life style you have several options here. You can add more food to the 5 meals (3 main meals and 2 snacks) or, for example, add an extra snack after a main meal. If you usually go to bed late, you can have a last night snack one hour before go to sleep. Add an extra snack before or after dinner. It really depends on your daily routine, and when you feel most hungry. If you find that 1 morning snack it’s not enough and it feels like a long time to wait for your lunch, add an extra morning snack. If dinner seems like a long way off, add an extra afternoon snack. 2 Purple Containers – Have fruit before a meal and snack. I prefer to have fruit before rather than after meals. 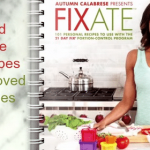 The FIXATE cookbook is an amazing recipe book that contains 101 recipes that are all 21 Day Fix approved. The book was written by Autumn Calabrese to provide a wide variety of recipes for people to enjoy that are not only healthy but portion appropriate. You will find a wide variety of recipes including Vegan, Vegetarian, Paleo, and Gluten-Free, as well as desserts and snacks. Autumn is from a family that loves food and has even ensured that many of the recipes in this wonderful book are kid friendly as well to help the whole family eat healthily. Learn more about the Fixate cookbook in my review here. Here are some easy, healthy and tasty recipes for the different meals of the day. You can also download, for free, our Days to Fitness recipe book that includes 37 Recipes, all of which are 21 Day Fix Approved. Find more and get yours for free here. Snack Recipes -Have a healthy and approved snack between meals. Snack Approved recipes here. Lunch Recipes – For best weight-loss results, you have to pack your lunch with protein, carbs and veggies. Here are some 21 Day Fix approved recipes for lunch time. Dinner Recipes – For your last main meal of the day, don’t forget the protein, remember to avoid carbs, and add an extra portion of vegetables. Here are some easy, healthy and tasty recipes to try. Dessert Recipes – You don’t have to avoid desserts! Here are some 21 Day Fix approved desserts ideas. 6 Easy Steps to plan and prepare our meals in advance so we have a nice, healthy 21 Day Fix approved meal ready for lunch time. Continue here. It’s impossible to argue with the success or popularity of Shakeology. Far and away one of the most effective weight-loss solutions on the planet today, Shakeology takes advantage of everything we now know about nutrition and a healthy eating lifestyle and condenses it into super simple to make – and absolutely delicious to eat – healthy shakes. So much more than a meal replacement solution, Shakeology is a lifestyle change that can help you achieve the body of your dreams. Unfortunately, when you purchase Shakeology directly from the folks behind it, you are always going to have to pay top dollar and a premium – most of it just for the brand name. Thankfully, there are a variety of alternatives that you’ll be able to take advantage of that will give you the same (if not better) results while tasting fantastic at the same time! Still not sure how to start ? Or what you need ? Let’s be prepared to make the change. Read more. No strawberries or spinach? Lettuce hurts my stomach. It took me many years to figure it out, but I realized the cheaper head of lettuce bothered my stomach. I tried the darker green lettuce options and they do not bother me. I am not saying it won’t for you, but just wanted to mention it. Yes we are. If wouldn’t mind a suggestion, give a try to Kefir. It’s sugar free, cheap, lactose-free, healthy and high on calcium. I’ve recently published an article “10 Superfoods Good for you” and Kefir is on the list. Have a nice day. Where do you find sugar free kefir? I got this Milk Kefir on Amazon.com . I only add milk, wait for 24h and kefir is ready. I have this issue to, with advanced crohns disease i need a high protein low fiber diet. Thats harder then it sounds. I’m noticing you only respond to questions relating to shakes and refer people to the same reference when they have a specific question. I’m considering your program but you are not answering some important questions: Where is the instruction manual in the package? How do I navigate other proteins? How do I eat out? Are any “treat” items allowed? How do I measure your recipes that have combinations of foods? I try to reply to all the questions as soon as possible. Lately I’ve received a lot of comments, which I love, but not always I’ve the time to reply immediately. Regarding your questions. 21 Day Fix is not “my program”, it’s a beachbody program. On the 21 day fix package you’ve a Eating Plan, explaining how the diet plan works. There you can find all the information you need to get started. Navigate other proteins ? If you are referring to shakeology alternatives, you can find my article where I share the ones I consider the best alternatives. If you mean protein powder to make protein shakes, I’ve shared a guide about “How to choose the best protein powder“. Eating out, the Eating guide (included on 21 day fix package) explains how you can adapt dinning out meals with 21 day fix containers. When you cooking a combination of foods you can measure separately each ingredient. Measure the ingredients cooked or raw, depending how you eat it. So tomatoes on a salad you measure raw tomatoes, tomatoes for a pasta sauce, measure the cooked tomatoes. I’m sorry, pills ? It’s not my program, I’m only sharing information about 21 day fix. Can you continue 21 days of fitness after it is over? Exactly how does this all work? Yes, sure. After you finish 21 day fix, you can start all over again. This will help you to create good habits like eating healthy meals, do workouts, eat fruit and vegetables, reduce carbs and sugar. You do not take pills with the 21 Day Fix. Actually, I dont believe it’s something you do with any BeachBody program. You can purchase their vitamins but it’s not mandotory to continue with a BeachBody program. You must have her confided with another program that isn’t endorsed by BeachBody. Thanks Kim for your comment 🙂 Exactly ! No pills, instead, nutrition and exercise, healthy habits for better and longer results. Change small habits, slowly make your life better and you’ll see & feel the results. All starts with your attitude. Keep your motivation high and choose the healthy way. Have a nice day. What are the spoons on the breakdown of the portion amounts per calorie range? Thank you for this post. I am debating if I should order this 21 day fix program. My question is once in a while I would like to eat pizza or fried rice or chow mein and how would I break it down to appropriate containers? When you order the program, it comes with the eating plan and it tells you different restaurant foods and the portions of the containers they use. You’re website has been extremely helpful…thank you for putting this information together!! Thanks for your kind words. Soon I’ll publish protein shakes recipes as an alternative to shakeology. 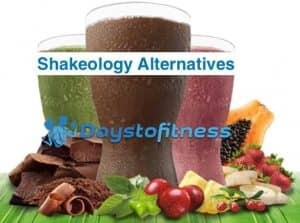 If you are looking for shakeology alternatives I’ld recommend you to check my updated article “Shakeology Alternatives”. There you can find meal replacement shakes for weight loss, that are cheaper than Shakeology and very effective. In the end of the article, you’ll find recipes of some of the shakes I drink. Hope I’ve answered your question. Can I have a teaspoon of raw sugar on the 21 day fix in my coffee? Hi Sarah, maybe I missed it, but you reference 2 Oils (grey) in your chart above. I’m assuming you mean for cooking, but does that mean tbsp? Would that not be included in the seeds/fats (orange) group. Just want to make sure I don’t overdo the oils by accident. Thank you for your time! The United Nations website stated that the average person needs 2100 calories a day and anything less is considered starvation. That’s why this diet works, I just worked out my suggested calorie intake with the 21 day fix and it’s suggested I eat 1200 calories a day. That is 900 less than my body needs for my organs to function properly. Yes starving myself will rid my body of fat and the work out routine/less body fat will showcase my muscles. But at the risk of my health? No thank you. This is promoting anorexia. You can look healthy on the outside but if it’s only because your not consuming enough calories that is dangerous. I respectfully disagree with your claim on average caloric intake, and would love to see your citation that can back that up; because my understanding could be wrong if that’s the case. What I have understood is the National Institue of Health (NIH) and the Mayo Clinic report that your average caloric intake depends on your height, age, weight and level of physical activity. The mayo clinic’s website even has a calorie calculator (link removed because is broken) that will calculate your needed intake. The 21 Day fix puts me in the 1500 cal. category as well. Now obviously with added exercise I agree with you that sustenance should be added. But so does the 21 day fix – which is why the program recommends that if you are hungry you add more veggies, which are healthy calories. All in all – every person should learn to be attentive to their bodies and what our body is asking of us. If you are hungry – EAT!!! Not eating when you are hungry is my definition of starvation. Regarding to your comments about diabetics. My husband was diagnosed as diabetics type 2 in 2009. He refused medications. He want the same as me when I lost almost 4 stones (56lbs) using healthy and fat free diet by Rosemary Conley diet which I was a member. Now he lost around 60 lbs and no longer have diabetics but need to watch out because it could come back if not careful. It sounds like he had Insulin Resistance and by losing that weight he was able to control it. I am also type 2 Diabetic and was diagnosed 9 years ago. I have gotten it under control a couple of times but that is all it is. I try to stay away from the concept that it is “Gone” in any way. Once you have activated the genes that are related to Diabetes they are stuck with the switch in the on position. By continuing to take care of yourself and eat right you are effectively decreasing your Insulin Resistance. When I started to think I had “Cured” my diabetes I immediately started falling off the wagon again and was worse than I had been before. The mental idea that I always had the disease and was controlling has helped me ever since then. Even at my lightest weight, if I had something with Sugar in it, I would still observe high numbers hours afterward. You just have to keep an eye on it, and stick to the plan. Can you tell me if a boiled egg is one red container, or 1/2 red container? 2 hardboiled eggs is one 1 red container, so 1 boiled egg is 1/2 red container. If you plan on adding fruit, I love fiber in the morning. You can add 1 banana which is considered 1 purple container. Down 8 lbs In 3 days ?????? I want to purchase the 21 day fix but I have allergies to dairy and nuts and I have celiac disease not sure if there are any good recipes in the 21 day fix that will be good for me please help…. With dietary restrictions its probably best to talk to your doctor about how best to modify any “diet” to work for your life, I like things like this as a starting ground but they work best and stay realistic when we all learn to modify to our needs. Question do i measure food before I cook it or after? If I’m eating the food raw I measure it raw. If I’ll cook it, I measure when it’s cooked. I order the 21 day fix extreme and also the shakeology powder. My calorie is 1200 I need a 21 day meal plan and I want to take the shake for breakfast sometimes. How can I get a meal plan base on my calorie intake. I am currently doing the ideal shape meal replacement ..how does the shakes fit into this program.. At this time I do a shake for breakfast, a shake plus something for lunch,and then a meal bar at 5 and then dinner whenever it gets done..the bar helps me from not eating the house when I get home but I have to eat so late because of what time I get home…can I use this program with the other one? Thank you for this information!!! This is super helpful and you make it simple to follow!!! I started the 21 day fix on April 28, preparing for a wedding the first week in June. I was at 140, and wanted to get down to 130 to fit in my size 8 dress. I kept to the food plan and did the exercises every day. I am now down to 122 and still exercising 5 days a week. I am still using the containers but have stepped up to the next food level to maintain my weight. I am 51 years older and I look and feel better than I have in years. The food plan is easy to stick to because you definitely will get enough to eat. I drink a lot of water and hot tea throughout the day and I do not drink any diet coke ( a 30 year habit I quit wile on this plan). My body looks great and my husband can’t keep his hands off me. This plan works, but you have to stick to it. Thanks Autumn! Did you do the Shakeology with it as well? I am wanting to begin the 21 day fix, but not interested in the Shakeology, but not sure if I’m going to get good results without it. I’ve used Shakeology but as a meal replacement shake diet plan separately not with 21 day fix. This meal replacement shakes for weight loss reduce your calorie intake, when compared to a full meal. So yes, it will help you to lose weight and achieve better results. You can go for shakeology alternatives, that are cheaper and very effective (the shakes alternative I’ve used with my recipes). Remember, the most important is to stick with your calorie target and take the number of containers you’ve for the day and follow the 30 minute workouts of 21 day fix. If you’re consistent you’ll get good results. Hope I’ve answered your question. I’m a vegetarian. Does 21 day fix tell you what to eat or you have to do that on your own?! I just read through your outline of the program. It looks very interesting. However, I am appalled at the number of typos and grammatical errors. This makes me wonder how good your program could possibly be, if you pay such little attention to detail. It’s not her program. She’s just providing some information to people that may be interested in the 21 day fix. Question, I can not eat seafood so can I substitute everything with Chicken? That sounds a nice substitute 🙂 Enjoy the recipes and, more important, enjoy your meals ! I have a quick question regarding the size to ounce ratio. Instead of using the 3 3/4 cup, am I able to measure our portions by the ounces? Or will we be consuming too much because we will be meauring by weight rather than volume? Hi. 8 oz is 1 cup. Or do you measure 1.25 cups for this purpose? I see there’s no sugar at all. Is that correct? No sugar at all where ? I don’t understand your question, sorry. Can you address Brenda’s question? I am also wondering the same, are there any gluten free recipes? 21 day fix includes an Eating plan book explaining in detail how color coded containers system works and in the end you’ll find some recipes. There are no 100% gluten free recipes. But there are some where the only ingredient with gluten is olive oil, which you easily substitute. If you are looking for gluten free recipes to use on your 21 day fix plan I recommend you to check Fixate cookbook, my review here, with all the containers information you need. i have a question about oatmeal. i buy steel cut oatmeal in the packs. 1 pack of oatmeal equals how many yellow containers??? 21 day fix color containers were made to make it easy to measure the quantity of the type of food (Protein, Vegetables, Fruit, Dressings, Carbs, Fat) you use on each recipe. 1 yellow container is approximately 90 calories from 22,5 grams of carbs. Specifically for Oatmeal it counts 1 yellow container of 1/4 cup dry oatmeal cooked. Hi there- how can I get a full breakdown of containers and how many grams per? I was tirelessly searching for a breakdown of carbs in grams per yellow container until I found this. I’d like to know the breakdown for the rest tho! I am a vegetarian. I do eat eggs and dairy. Food like beans,lintels ,quinoa, oats etc are combination of carbs and protein. I am confused!! also I cook India veg at home. Can you help me what should I count as protein and what as carbs? I noticed cream soups on your sample diet. Are these canned soups or home-made? To calculate your baseline you have to multiply your current weight for 11. If you’re number is less than 1200 round it for 1200. Baseline is a part of the 21 day fix formula to calculate your calorie target. Hope I’ve answered your question. If my calorie in take is 1200 per day based off of this program , how much protein should i be consuming a day? Protein is 4 (3/4c or 6oz) 4 times a day. which comes out to 24 oz of protein a day? I think you might have answered this question previously but it didn’t mention Shakeology specifically…just protein shakes in general. I’m in the 1200-1400 calorie meal plan but I’m doing Shakeology as one of my meals. How do the shakes work into my meal plan? What containers do the shakes count as? Shakeology, as other meal replacement shakes (like the ones I’ve shared at “Shakeology Alternatives”) count as 1 Red container. If you add fruit or veggies remember to also count a green or purple container. Good luck ! I am in the highest bracket weighing about 320 (haven’t weighed in a long time. . But I’m sure I’m over 300… and I’m having a hard time even eating all of the food. I am now on day 4 and as each day progresses I am eating less and less of my portions. It’s this normal? I felt absolutely stuffed yesterday and had 2 green,1 purple, and 2 red left. Thank you so much for your time and effort to give us this information! I’m just starting the 21 day fix and I’m wondering when/ how often I should add my shakeology into my diet? Should I drink it every day in the AM and still have lunch and dinner? While doing the 21 day fix. What’s the time duration between each meal/snack? The same time you had before starting 21 day fix. The snacks are between meals to prevent overeating at mealtimes and keep your blood sugar levels steady. Hope I’ve answered your question. I’ve heard specifically you should eat something every 2-3 hours, and eat breakfast no later then 1 hour after you wake up. This increases/speeds your metabolism, which results with your body burning more fat instead of storing it. Therefore, the longer you go without eating everyday, the more your metabolism slows which results in your body storing fat instead of burning it. From what I’ve researched about it, it’s lactose free. Although, since it’s made of 90% whey pure protein isolate the other 10% of the ingredient may contain lactose. Also contains enzymes to help with the digestion and of the enzymes is Lactose. So, it contains a some Lactose but for some lactose intolerant persons can be too much and for others might be ok. You can find here (“Best Meal Replacement Shakes for Weight Loss“)examples of 100% lactose free meal replacement shakes that can be used as shakeology alternatives. Also, do you have any guidance for dining out on this plan? I’m about to start when my products arrive and am trying to stock my cupboards appropriately. Hi! Thank you for this article. My biggest concern/question relates to what happens after the 21 days – how do you keep the weight off or continue to lose weight if you have not reached your target? Is there a weight maintenance part of the plan? Thanks! I am a vegetarian and try to get enough protein.. am I able to use greek yogurt for the protein container or do I just stick to the blue? The fact is that a Greek Yogurt of 170 grams contains 17 grams of protein for only 0.7 grams of Total fat. So your logic makes total sense for me. Regular yogurt doesn’t contain so much protein but includes more fat. As an alternative you can try protein shakes (“Choosing the best protein powder for you“, or meal replacement shakes (“Best meal replacement shakes for weight loss“). I wake early in the morning how long after waking should I eat and what if I eat all my 6 meals by 5 do I just not eat for the rest of night? If you’re wanting to lose weight and you eat all 6 of your meals by 5:00 p.m. you have the option of adding one additional green container but that’s it. After one more cup of veggies you’re done for the rest of the night. I have lost the weight: how do I eat now? I am confused. So if you don’t buy the “canned” program then you have to buy extra containers? How many of each come with the program? What color container would turnips be? I just ordered the 21 Day Fix with the Cize exercise program. I am older (57) and have some health problems along with bad knees. I’m also about 100 pounds overweight. My calorie intake comes out at 2300 but I’m afraid I’ll never lose weight eating that much, especially since I’ll probably only be able to do about 10 minutes of exercise to start until I build up to the full 30 minutes. Should I eat the 2300 calorie plan or should I drop it down one or two levels? I just ordered the 21 Day Fix; however, I’m older (57) and extremely overweight (260 lb) so I have a hard time exercising. I ordered CIZE but will need to slowly work up to getting in the entire 30 minutes. Since I’m older and not active I can’t imagine I’ll lose weight eating the 2300 calorie program. Would it be okay for me to go down one or two calorie levels? Hi, thanks for the info. I was wondering how soon after the 21 days can I do the 21 days again? If I only lose ten pounds, my goal is to lose forty pounds. So should I do this for 84 days? Continue eating healthy, control your calorie intake, and do consistent workout and you’ll continue to lose weight. After you finish 21 days you can always start it again. Keep your motivation high, draw your goals, be consistent and you’ll be surprised with the results ! 1/2 a banana equals 1 purple container, 1 slice of bread equals 1 yellow container. If you check the guide book it breaks it down for you. So, how does this work if you want to eat something like a slice of birthday cake, or a casserole of some type? I made chili today, and will be making tuna casserole next week. Is it very difficult to fit things like this into the system. I am cooking for a family, so this is important to me. 1 slice of bread is a yellow. There is a mixed food guide on page 71 of my book which has a portion guide for both chilli and tuna casserole. No cake though. The reason this program works (for some people) is because it follows the same premise that other successful programs follow, it’s primarily a whole foods/paleo style diet. Looking at diet example plans, I see nearly all of it is whole foods which is good, but this is no secret. Where it fails though is calorie/portion control, this has been proved false time and time again. Any type of caloric restrictive diet rarely works in the long term and the main reason is the cortisol response into withholding yourself from food when hungry. It creates a stress reaction which produces a flood of insulin in your system which will completely block any fat burning. It’s also been found that obese people have either lower or the exact same caloric intake as someone who is lean, and the reason behind this is cortisol (and Leptin if we want to get technical). Plenty of people lose weight easily on 3000+ calorie a day diets while others still put on fat eating 1000-1500 calories. People commonly put on fat on 1200 calorie a day diets . There is only 2 constants among this and that is insulin and leptin. It doesn’t matter “how much” you eat, but it matters “what” you are eating. Where this diet shines is the flood of whole food choices. Where it fails is idea of portion control. All people need to realize is get your food from whole food choices. Fill up on meats and vegetables, minimize the sugar, minimize the starches to in and around your workouts as to take advantage of insulin sensitivity. Don’t drink sweet drinks; stick to water, coffee & tea (without sugar). Keep your stress levels at a minimum, no chronic cardio, and keep your exercise periods short and intense. When weight loss stalls, carb back up to increase leptin levels again to continue the fat burning. That is the secret. what do i do if I am having to lose a lot of weight….I was looking and it only gives you up to 2300 calories for the meal plans. How do I know how many of each color container to eat? I just ordered the containers with the cook book. No other information came with it like equivalents to containers when eating out or how to measure things that don’t fit into the containers or what to avoid with snacking? Doesn’t how to work the program come with the containers? Thank you for your help. Hello, I am pregnant and my question is if i can use this program while i am still pregnant? and also can i use it when i have my baby and if i want to breast feed for as many months as possible? NO!!! Not while you’re pregnant! You won’t get the same nutrients for your baby. Even Weight Watchers forbids pregnant women to participate, but they can afterwords. Do your research! How does something like canned pineapple or chicken broth work? What if you use nonfat milk in your shakeology? What is the container that can be counted? For example, shakeology scoop is red container, if I add fruit or veggies, I have use green or purple also, and then if I use nonfat milk, do I count a yellow container as well? If so, I see that nonfat milk can only be used 3 times a week, so does that limit how often I can use milk in my shake? Would I use only water for my shake the other days? I am a server which obviously burns calories but also I ride my bike to work which is about 6 miles each way. How do I take that into consideration when I calculate my calorie plan in the beginning. I dont want to be to weak to exercise or obviously work. what kind of drinks can u have on this plan? like tea, coffee, etc. Drink plenty of Water, tea, coffee . Try to avoid sugar added drinks and alcohol (contains a lot of calories). Is all natural canned fruit (pineapple/no sugar added) fix approved? I really love wraps. I just wasn’t sure if they would count for 1 or 2 servings of carbs. They are called flat out. I just ordered to 21 they fix will be receiving a coupla days so excited to start. Keep on the motivation and get ready to start your journey 🙂 All the luck ! For the purple container, does fruit cocktail ok? So if you add a shake how do you compensate the containers calorie wise please? Do you have to eat less of a certain colour etc? If you use shakes to replace a meal, like shakeology alternatives or meal replacement shakes for weight loss, you have to count 1 red container. Why ? Because this shakes contain protein. If you add fruit to the shake you’ve to count also the fruit you’ve added. Hope I’ve answered your question. Question what about Smoothies ? I didn’t get your question. I’ll try to make a guess, Do you mean, how do we count smoothies using the container system ? If you add protein, like a protein shake, or a meal replacement shake, you’ve to count a red container. If you add fruit, remember to count as a purple container. If you do a green smoothie, recipes here, count a green container. Smoothies are a great way to add fruit and vegetables to your diet. When following 21 day fix diet plan, or any other diet, green smoothies and fruit smoothies are a perfect way to add raw veggies and fruit in a quick and easy way. No sugar added, no cooking, but when mixed with other fruits they get tasty and fun. Check our smoothies section and you’ll find nice surprises. Can I use the portion control and do the P90X workout instead? Would I still receive good results? I see the portion control as a learning process. Knowing how much you should eat per meal, to don’t skip meals, cook your own food instead of buying processed food, avoid added sugars, and understand how energy (calories) coming from different sources affects your body in a very different way. So answering your question, Yes. You can use the portion control as your diet plan and P90X workouts as your workout plan. Does that make sense to you ? Hope I’ve answered your question. Which bread and pita would be best? And how do I measure it ? I ordered the system and need to base everything off of a 1200 calorie diet. However, I can’t find information on how many of the different colored containers I can eat each day on a 1200 calorie plan. Also- how do I figure out which container it goes into if it is a mix of veggies, carbs, protein, etc? Like a casserole or veggie quiche, etc? Can you point me to an online guide as I can’t seem to find it. Thx. In the sample diet plan, I don’t see any caffeine listed. I don’t drink sodas, but have a hard time in the morning without my coffee, with small amount of organic half and half. Do I need to try to give that up completely? Your information is very helpful and motivating me to start the regimen. I just have one question. What all exercise equipment do I have to be ready with before starting. Do I need any bands or weights or chin bars etc? Please advice. That’s a good question. On 21 day fix, 15 lbs resistance bands are needed for some workouts. I bought the Black Mountain Bands set (available on amazon.com). It contains different bands resistance, in case you want add more weight. I’ll post my opinion about this product soon. Thanks for your comment, hope I’ve helped. Hi Sarah, My target Calories are 1465, do i follow the target calorie calendar for 1200 or 1500 my weight is 165 lbs i think i did it right ? I would suggest you to go with the 1500. Good luck with your journey. Thank you Sarah, got to say good info. love you page ! I’m sure you’ll hear from me as i go on my Journey. i got the cook book but it did not come with the step by step guide, so how do i get one ? Thanks for your message. What cook book are you referring ? Fixate ? Okay thank you, and I just got it so reading I will do . I’m so happy I found your page! So much helpful info! I just ordered my 21 day extreme plus shakeology program. My question… I read through the eating plan and I can’t seem to figure out …. using the colored containers what is a shakeology drink? 1scoop shake is equal to 1 red protein container? does that mean when I drink the shake I count that as using 1 protein? Hi Fay. Exactly one shakeology drink is 1 red container. If you add some fruit or vegetables to your shake don’t forget to also count those containers. Good luck with your 21 day fix extreme journey. According to this program I should only consume 1200 calories in a day. Am I allowed to consume more calories when I workout? I know I would feel dizzy and have no extra energy to put into my workout on only 1200 calories. Hi Heather. If you feel dizzy try to add some protein before your workout. Add more calories but don’t add processed food, cook your own food to give you a boost for your workout. How critical is it to stay in your calorie bracket? I am in the upper end of the 1800-2099 bracket and have a hard time eating all that food… can I move down a bracket? Hi Sarah. Sure, if you have a hard time eating all the food, try a lower calorie intake. Hi Sarah, Do you know if 2 tsp of sugar, a day, will derail the 21 day program? I have 1 cup of coffee a day and have tried but do not like any of the alternatives for sugar. Hi Robin. 2 tsp of sugar day is no problem, The American Heart Association recommends 6 teaspoons (24 grams) of sugar per day for women (from my recent article “5 Healthy Reasons to Avoid Sugar”) But don’t forget that most of processed food (cereals included, more about processed food here) have sugar. Some months ago I also used to add sugar to my tea and coffee, and I also didn’t like the alternatives, so I stopped adding sugar and you know what ? Now I enjoy way more the flavor of my coffee and tea. Give a try ! First time it will taste strange but you’ll easily get used to it and then you’ll love it. Thank you so mush for that. I may try my coffee without sugar. I have to say, I was a skeptic about this diet plan, didn’t think I would be able to stick with it, but, it REALLY DOES WORK. I have been on it for only a week and have lost a few pounds. WOW! I’m hoping to lose about 25 – 30 pounds. Hi Robin. That’s an amazing 1st week. Yes, give a try to coffee/tea without sugar, it helps a lot to reduced your added sugar intake and you’ll start to enjoy the real flavor of coffee or tea. This month I’ll publish a new,very easy to follow, no-sugar challenge. I’ll share my amazing results of 1 month without added sugar and, most certainly, you’ll be surprise. Stay tuned and have a nice day . A friend of mine has lost a lot of weight on the 21DF/Beach Body program and I’m excited to try it. I’m wondering how you get linked up with a coach/mentor though. What’s the best way? Thanks. I’m a little floored about the daily calorie intake. If I wanted to lose weight, why would I want to eat the calories for my current weight? Wouldn’t I want to go down one step until I hit that and then follow again until I am at my desired general weight? Hi SARAH, First of all I have to say “you are a Saint” … Reading the LONG list of questions and your responses I think you are amazing and people always surprise me when they respond or comment in a negative way 🙁 You are only trying to give your opinion and help. Thank you! I am currently breastfeeding, and I’m wondering if you would recommend the meal replacement shakes for me during this time? Thanks for your kind words. I would recommend you to talk with your doctor as I can’t and shouldn’t really advice you on such decision. Hope you understand. Thanks. Have a nice day ! What are the little spoons for? My calorie target is 1800 -2009, I’m finding that the allotted amount of food is more than I can eat comfortably. I’m concerned if I’m eating less calories will I lose weight. 5 Veggies,, 5 proteins, 3 fruits, carbs, 4, etc. I don’t eat a ton of food yet can’t seem to lose weight. I’m going to try the 21 day fix, but I weigh in under the highest calorie category–2,300. Do I have to eat within my category to lose weight or can I eat less containers? Hi Claudia. Sure you can mix different things. 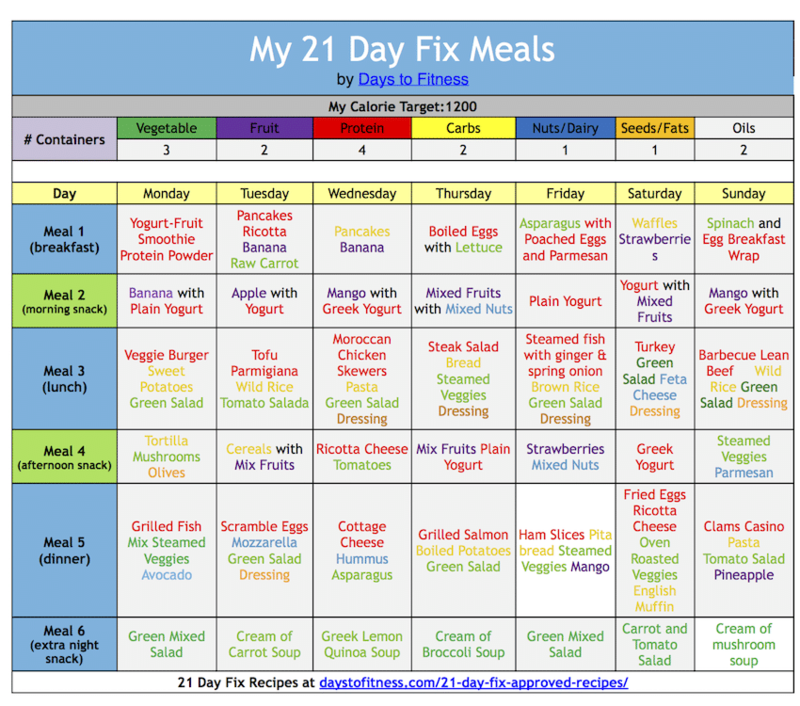 Check your 21 Day fix eating guide to see what belongs to the blue container. I’m considering the 21 day fix and am unclear about the shakes. Are they a mandatory part of the program? I’m a fan of eating only real food so am excited about the protein powders and shakes. Can you do the program without the shakes? Thanks so much! Shakes are not mandatory. You can do 21 day fix without any protein powder or meal replacement shakes. The idea behind the shakes is to lose more weight faster. Follow your diet plan and your exercises and you’ll feel better and burn fat. Do you know what I would do for caloric intake since I’m breastfeeding. I’ve been told by numerous people, including lactation consultants, to increase my intake by 500 calories. Do you know if that is true with 21 Day Fix? So, my calories came up to over 2300 so I follow the 2300 calorie calendar which is the 1200 calorie calendar plus 3 additional Green Containers, 2 additional purple containers, 2 additional red containers, and 3 additional yellow containers? And I am allowed 1 extra snack if hungry? Did I get that right? Yes that’s it, you got it perfectly ! All the luck . Motivate yourself, enjoy your meals, find the exercises you like and don’t look back ! It’s harder to start, but once you get motivated get’s harder to stop. I just ordered a set of containers and I am ready/excited to incorporate the good eating with the workout! Question though, I am not a fan of eggs or salmon…..what would be a recommendation for alternatives? Hi Kristen. Depends where you want to replace the eggs. If you are looking for a protein alternative you can try tofu, cheese, beans, lentils, yogurt, nuts, and seeds. I’m also replacing Salmon. There are other also high on Omega 3 foods like flaxseed oil, sardines, mackerel, tuna, Walnuts, chia seeds, flax seeds. Hope I’ve helped. Have a nice day. Thank you! I love tuna so that is a great alternative. For the eggs, it would be for breakfast. … I’m thinking the overnight oatmeal for the week, but would like to incorporate the eggs or an alternative (the egg recipes in the book look great ). Hi. Happy I could help. Thanks for your nice words 🙂 Enjoy ! Hello! Super excited to start! I got the program from my friend…but only got the DVD’s, containers and FixAte cookbook. I’m needing the exercise plan, meal plan and other instructions. Could you help me out?? Also, my caloric intake is 1,762. I’m EBF my 8 month old. Should I intake more calories?? My goal is to loose 50 lbs, my hips hold on to extra reserves. THANK YOU! There is no way that formula is right, I’m 330 lbs and with this formula i should be eating 3280 cal a day!! no one can lose weight eating that many calories. Knowing the number of each color container you can have per day, I organize the meals and snacks for the next day. While cooking you fill the containers just to be sure that everything go as planned. I usually prepare my meals in advance on Sunday, you can check my article “How to Plan Your 21 Day Fix Approved Meals ?”, where I explain in detail how I do it. I’ve lost my book and don’t know how many containers I need to have for a calorie target of 1960. Can anyone please let me know how many of each container I’m suppose to have daily? I didn’t receive your email with the online material and i selected the ”yes, add me to your mailing list”. What did I did wrong? I’m sorry about that. Can you go to the bottom of this page, on the footer, fill the First Name and Email field and click Subscribe. You’ll receive a confirmation email to confirm your subscription. After confirming you’ll get my first Welcome email. Thanks for your comprehension and cooperation. Have a great day. I would love the answer to this question -I notice some of the recipes: Buffalo Turkey Balls, Healthy Glazed Meat Loaf, Red Lentil Patties “Vospov Kufta, Red Lentil Patties “Vospov Kufta”‘ Crock Pot Stuffed Enchilada Peppers, do not have container count or how many servings equal containers. I see recepies on Pinterest but am new to the program so wonder how you figure in the containers if it’s not listed. I was wonder what category 1 Shakeology drink qualifies for. Is it considered a protein? And how many servings for 1 package. Thanks for your comment. Yes of course. Where does hummus fit in to this ? is it a protein ? thank you !! love your article ! i have been drinking Herbalife shakes as a meal replacement , but noticed they are high in sugar. i use there protein drink mix with their formula one to make a shake /meal replacement. is there a way to use this product with the 21 day fix ? i bought alot of it 🙁 thank you plz help !! Thanks for your comment. Hummus goes in the blue container. Since you bought a lot, let’s find ways to not waste all that money. If the shakes are high on sugar, cut the sugar on other things. Don’t put sugar on coffee/tea, no sodas, reduce alcohol, avoid cookies, avoid ice cream, instead do your own ice cream. Don’t eat processed food. Check the nutrition labels and avoid food high on sugar. Hope I’ve helped. Formula 1 goes in the red container. 9 g of sugar is low, a banana has 14. I really like your meal plan without the shakeology , but if I feel froggy one day and want to add a healthy shake option , where would this fit in , what category does it replace for the day, how do I know I’m still within my calories?? Thank you! does the carbs (rice, bread, tortilla, etc) have to be whole wheat? hi again … just a silly question i am confused on how many serving are in each recipe , some say like makes 8 pancakes some dont say how many servings ?? . but in the pancake one , so each pancake counts as a serving from the containers you listed ? thank you . i really want to do this correctly. In the waffle receipe how many servings ? love your pages…. can you have sour cream , if so which container and can you have sugar free syrup with your wonderful ricotta pancakes ? Thanks for your kind words. Sour cream is not allowed on the 21 Day Fix Eating plan. You can use, as an alternative, nonfat plain Greek yogurt. Hope I’ve helped. Have a great day. love the 21 day fix. I am 46 years old i was 156 lbs and now i am down to 111 lbs. I did follow the portions for each container. I am a very picky eater so I basically ate what I wanted. I ate fried foods, rice, potatoes and bread. Mine consist of 2 fruits, 3 veggies, 4 proteins, 2 carbs, 1 fats and cheese, 1 seeds and dressings a day. So you can still lose by eating what you want as long it is in the portions and no more. Thanks for your 21 day fix feedback. Have a great day. Thanks for your 2nd edition recipe book! Lots of great ideas. On page 7, the recipe for the banana flatout wrap looks like it has the nutritional information for the page before the Baked eggs in avocado. Can you provide the correct info for the banana wrap? First and foremost I want to thank you so much for putting so much time and effort in making this webpage. It is so helpful for someone like me. And the recipes look great. I have to true them. When I figure out how to use the containers correctly. This leads me to my question below. This is my first time and I am a little confused. I will be using the 2300 target. Confused about how many containers I have to incorporate. Example: Per your Calorie target of 1200. Dear Lord it seems like alot! Yes that’s correct. For a 2300 calorie target, following the 21 day fix eating plan, you should have 6 greens, 4 purples, 6 reds and 5 yellows per day. Does it seem a lot ? Have you tried ? If you feel like you don’t need all that, recheck your calorie intake or simple remove a few yellows and reds as greens and purple will not be a problem for your weight loss goals. Remember you’ll also be doing the 21 day fix workouts every day. Hope I’ve helped. Have a great day. The shakes replace one of your meals or a snack. So a shake is usually 1 red container (because meal replacement shakes contain protein), if you add fruit or vegetables considering counting a purple or green container. Let’s say you have a breakfast of 2 hard boiled eggs (which is equal to 1 red container), and you replace this breakfast for a meal replacement shake equal to 1 red container. You would replace the 2 hard boiled eggs for one meal replacement shake, keeping the same red container but the meal replacement shake will make you feel full for longer has contain more fibers and nutrients. Hope I’ve helped. Have a great day. My target score is 2,030 so am I using the 2300 calorie intake each day? Where do I find out how many containers in need to eat? I didnt see it in your article? Very helpful information. I have a question. If my targeted caloric intake is 1,157 and I am in the range of the 1,200 – 1,499 calories, what container can I eliminate to make sure that I do not go above the 1,200 calorie mark. I cannot find the answer to my question even after asking several Beachbody coaches that I know. Look forwards to your reply. I am going to start the 21 day program very soon. I was wonder if there is a way to incorporate juicing at all and how to count this as a portion. I was also wondering if you consider Vega one protein as an alternative to shakeology. It wasn’t on your list but I found it on a different website that was also comparing protein powders to shakeology. Thanks for posting this information. It’s a good resource. 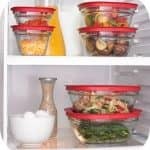 One thing I’d suggest is to refrain from saying the plastic containers – any plastic containers – are safe for microwave cooking or putting any hot food into. Even “clean” plastics are still plastic. All plastic breaks down and leaches chemicals. We happen to know about BPA, etc, but that’s it. It’s incorrect for us to assume once we remove those, then the plastic is now safe. It’s like saying removing fat from food makes it healthful. Neither are true. Thanks for considering this correction. Hi Bill. You’re saying that it doesn’t matter if it’s BPA and DEHP free you still shouldn’t, for health reasons, use it in the microwave or put any hot food inside? Do you have any study or any information regarding that matter? Thanks for your comment. I didn’t have time to read through the 222 comments but I am now dairy free. How would this plan work for me? As far as Dairy free this diet can be perfect, see your Dr. if you need a calcium supplement because you are dairy free. I am starting my 4th round on the 21 Day Fix, I have lost 48 lbs. I love this lifestyle because as a mother with 4 kids I just dump food in the containers and go. No weighing foods or counting calories= no work for me. I just keep track of how many colored containers I use in a day. I can’t believe how the weight is falling off. Best of all my A1C’s are so low I am no longer considered a diabetic! My blood work for everything was fantastic. My nurse practitioner hugged me and walked me out to the front desk, she also told me I won the best patient of the day award. (I have never had a Dr. or Nurse Practitioner walk me out when I left before, lol, she was really thrilled!) I was worried about having thinner clothes to buy as I loss the weight but I am finding everyone was some beautiful outfit they can no longer wear and they are giving me their clothes. I received 4 dresses in 1 week! I started 24/26 and am now wearing size 24 but, I fit a 2x jacket in a store last week! I actually bought a size 1x sweater to go on my size 3 x Easter Dress. It’s fitted but I know it will be absolutely perfect for my daughter’s RN graduation in 20 days! I did notice a difference in my energy level in 3-5 days on the diet, my outlook was brighter, and on the first round I did feel lighter and less tired when grocery shopping, lol, of all things! Give this diet a honest try and it will change your life forever. Everyone is asking me what I am doing and I share the good news. It is the best buy I ever made and starting out at 298.8 I believe it saved my life. I am 248.4 this a.m. and still going strong on the 21 Day Fix! You can do this, the sooner the better. God Bless You! Unless I missed it. My question is is one set of containers filled supposed to be your full day or just 1 meal. Yes this is my question as well! Like do I need to buy extra container or the given containers after I fill is that my whole days eating? Can i use these containers beyond 21 days? I have reached my desired weight and I just want to maintain it now and I find these containers very convenient. Sure thing, if it works let it shine! Have a great day. Just purchased this and I’m a bit confused about the containers. So I’m in the 1200 calorie plan just like you. So my question is, for example your chart says 3 vegetable containers, does that mean 1 for each meal? And so forth? So I would next extra containers if I planned it all out for breakfast lunch and dinner? And where would 1% milk fall into? What container?